Navy Lark Appreciation Society -- Ev'rybody Down ! It's Sunday, and for many the weekly church visit is over and/or a drink at their favourite pub or club is enjoyed while someone at home prepares the weekly roast during ‘Two Way Family Favourites’. Finally the family is assembled ready to share a tasty home-cooked meal with gossip and stories. Our lives were enriched by the week’s best music and comedy entertainment on the wireless, and for many of us 'The Navy Lark' was part of that tradition. For the entire run of 17 years, Tommy Reilly's evocative rendition of the Tradewind Hornpipe heralded around 30 minutes of naval mayhem. The comedy was set on an island near Portsmouth for the first two series and thereafter HMS Troutbridge was let loose on the Solent as well as enjoying occasional forays onto the high seas for the remaining 200 shows. Alastair Scott Johnston, the show’s producer - pictured here, had established an excellent portfolio of great entertainment on the Light Programme and was uniquely empowered to choose performers for his programmes without seeking Head of Light Entertainment approval. For `The Navy Lark` he had pencilled in Michael Denison, Thora Hird, Leslie Phillips, Jon Pertwee as well as Jack Hawkins as cast members. He saw the need to reflect an officer class who were career mariners alongside mainly conscript rank and file people with quite different approaches to national service or duty. Alastair secured the go ahead for `The Navy Lark` with a very demanding BBC management in an amazingly short period of eight weeks in early 1959 after the pilot show had been recorded. The original proposal went before the Head of Light Entertainment in late 1958; scriptwriter Laurie Wyman outlined the storyline of a small naval detachment on an island just off Portsmouth. Despite Laurie’s remarkable ability to create authentic sounding radio scripts, Alastair felt he needed to re-write parts of the first script, which was recorded on January 7 1959, because as a former services officer ( Captain & POW in Burma) he recognised how people from all walks of life expected different things from their time in uniform. He appreciated that serving hands worked hardest at things that interested them, and was keenly aware that officers tended to be ambitious and might find a ‘stone frigate’ (land-based) posting unrewarding, unglamorous and lack lustre compared to life at sea. More so as the island unit contained anarchic non-commissioned officers and conscripted personnel content to let discipline slide whilst engaged in money-making schemes at every opportunity such as relocating MOD property. Laurie’s time in Portsmouth researching for the programme showed him how very different his army and air force service history was in comparison to the naval world, which was a world of hospitality and wonderful days collecting ideas or stories as he toured the many messes or ward rooms around the Dockyard. We might surmise that on these expeditions he first saw Whale Island. With its privileged position just off Portsea, the view of Gosport from the Dockyard and that all important clear stretch of water separating different naval elements it was a worthy contender for `The Island` on which his Troutbridge crew could be based. The so called ‘Island Draft’ was created from a motley collection of people not really suited to the Senior Service but who were a terrific bunch of individuals full of team spirit and with optimism to spare. Their daily life featured exploits in and around the stores, local hostelries and the NAAFI. Ronnie Barker as Commander Stanton was the senior officer but world weary, rather incompetent and liable to ‘put-his-foot-in-it’ whenever he spoke so he liked to hide himself away in a dinghy, fishing with the single mindedness of an angler trying to catch ‘the big fella’. The real officer in charge was ‘Number 1’ who knew exactly what was going on, and for every shilling Pertwee made flogging MOD gear, sixpence ended up in ‘The Comfort Fund’. To complete the crew were a homesick Welshman constantly wanting promotion and a WREN who outwitted every male who tried to get the better of her. There has to be conflict in sit-com and this was admirably introduced by `Thunderguts` - a hen pecked husband constantly belittled by his wife because his effectiveness and promotion prospects ended as soon as ‘Troutbridge’ became part of his command. An interesting fact about Jon Pertwee is that he served in the Navy and survived the war because he was selected for officer training in spring 1941 which meant he left The Hood just before its final sailing to seek out the Bismarck. After the war he continued in variety entertainment, initially with service personnel and then in variety theatres in addition to more film work. 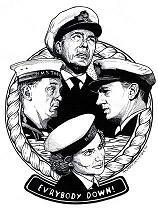 The navy was definitely in the Pertwee blood because cousin James Pertwee was Captain of HMS Troubridge in the late 1950’s from which Jon received regular internal bulletins and stories about carryings on, and excuses matelots used to avoid the wrath of their senior officers. With the addition of a ‘t’ to Troubridge, ‘Troutbridge’ was launched onto the airwaves. Laurie’s father produced the artwork for the ship’s badge by slightly altering the Admiralty registered version. The Troutbridge variant also managed to become a registered badge with The Admiralty. To encounter one Pertwee in a lifetime is rare, so to encounter two must have been unique for the production team, who must have thought that this family was so embedded in the Royal Navy that they clearly knew someone at every level in most departments who was capable of bending rules or achieving the downright impossible be it with appointments, equipment or orders. To create such a family friendly wholesome show Alastair selected a number of actors who were working in the West End at the time. Heather Chasen became the female lead and voiced all women’s parts - even talking to herself on occasion - until season four when Judy Cornwell joined the cast for one tour of duty. Ronnie Barker had been on the radio previously with Elsie and Doris Waters in `Floggit`s`; rumours suggest he was let go for getting too many laughs. He was an instant hit in `The Navy Lark`, and his scenes with Pertwee became moments of pure joy, As the series progressed, these encounters were made longer and funnier. Michael Bates, who was later to gain TV fame in ‘Last of The Summer Wine’ and ‘It Ain’t Half Hot Mum’ was very much the man-behind-the scenes actor creating well-recognised voices and personalities such as the Padre or the irritating fast speaking Flags. These voices were instantly impressive but in different ways. Tenniel Evans as Goldstein always mentioned his Welsh ancestry but was equally at home being a senior officer such as Todhunter Brown. This name was not easily pronounceable, and in the episode on 7 December 1960, two cast members stumble and ad lib on air. Richard Caldicot was cast as the constantly browbeaten husband to house-proud, penny pinching harridan Ramona. His nickname `Thunderguts` was due to his short temper and desperate need to make situations work by the book; unfortunately, this desperately ambitious officer was destined never to achieve the respect or control over the Troutbridge crew he so wanted. History offers us two versions about how ‘The Navy Lark’ came about, depending on which person you talk to. Option one is that following on from a number of shows on the Light Programme Alastair saw how `Hancock` and `The Goons` had moved comedy away from short sketches into longer plots. Laurie Wyman, who later changed his name to Lawrie as he thought it more masculine, had been script writing a number of shows. The two of them saw that ‘Bilko’ was doing well on television and felt they could tap in to that forces fun as two years` National Service was the norm in the fifties and early sixties, and so the storylines would be easily recognised. Alastair had an army career behind him, so he felt he would be too hands on when it came to the storylines. Laurie had a brief spell in the air force, got out and tried the army. It was recognized that the air force is very much about competences and quick reactions - otherwise disaster! They didn`t want to produce an army based show because ‘Bilko’ had that covered. Neither knew anything about the navy, but what they did appreciate is that ‘Jack Tar’ is forgiven every indiscretion because he has spent so long at sea. So the navy it was. Jon Pertwee tells a very different story: he meets with the BBC head of programmes, floats the idea of a naval based comedy with him, as a result of which Alastair and Laurie are brought in to flesh out the show, cast it and get it to air. Jon’s version suggests it took a long time, whereas Alastair says it happened in a matter of weeks. Both accounts agree that the programme`s first draft underwent a re-write, be it partial or complete, in order to get it completely right for radio. It went on to entertain on the Light Programme, The Home Service, Radio 2 and Radio 4 for seventeen years or 244 episodes, three of which were specials for the Antarctica Survey Team and one for HMS Troubridge before sailing off on a long commission. Although the ‘News Huddlines’ produced a greater number of shows, ‘The Navy Lark’ remains the UK’s longest running sit-com programme for radio, and can still be heard on BBC Radio 4Extra most weeks throughout the year. 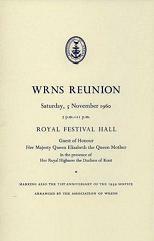 Queen Elizabeth the Queen Mother was totally enthralled by the show and Jon Pertwee’s biographer suggests she asked the cast to do a live performance at the WRENs reunion on the 7th of November 1960 at the Royal Festival Hall on London’s South Bank. The event was celebrating 21 years of WRNS since the re-forming of the service in1939 for World War 2. ‘The Navy Lark’ was placed after all the afternoon’s formalities as an entertainment to bring the celebration to a close. The cast all received an engraved silver dish/ashtray (Heather Chasen had a compact) as a personal gift from Her Majesty. These were personal gifts and not recorded on any inventory that the Royal Archivist carefully looked through in 2014. A big Hollywood contract lured Dennis Price to America in early summer 1959, which meant a replacement ‘Number 1 had to be found. Stephen Murray’s agent promoted him, despite his never having tackled comedy before, and so he became the more harassed 'Number 1' officer compared to Dennis’s upper class aloofness. By the time the scripts were ready, Dennis had returned to the UK virtually penniless and without any prospect of work either side of the ‘pond’. He asked for his job back, but according to his biography he was not wanted as part of the cast. It is suggested that Alastair, Jon and Ronnie decided they would prefer to work without him despite his superb comic timing because he failed to take 'notes' from, and I quote, "nonentities". Over the years I have lost count of the number of times the programme has been described as sexist and demeaning to women. Indeed I worked alongside a radio producer whose mind-set was so blinkered that her script for Sue MacGregor in ‘The Reunion’ in 2008 truly failed to celebrate the family fun, preferring to force surviving cast members to defend the script and their acting. Lifelong listeners know that the men are all wimps and it’s the women who rule the roost. The show was actually quite emancipated for its time, and the only person to elicit innuendo from any script was ‘loveable Leslie’ who would deliver an earthy laugh one moment and look at his Mickey Mouse watch the next. His lechery was seen for what it was: naive and without malice. The disappointing film version of ‘The Navy Lark’ was co-written by Laurie together with the celebrated screenwriter Sid Colin. The movie was produced by a virtually penniless Herbert Wilcox and was intended to reverse his and Anna Neagle’s worsening finances. He used the very best Cinemascope cameras of the day, a new departure for UK films in 1959, but to keep cost down it was shot in black & white. This was the last BBC radio comedy programme to transfer to the silver screen. Wilcox believed he could keep the title and change everything the listening public valued and still have a runaway success. Instead of keeping familiar characters and names, everything was changed which seriously affected audience appreciation. ‘Troutbridge’ became HMS Compton (W2723) a wooden hulled minesweeper instead of a frigate. ‘The Island’ became ‘Boonzey’ with strong links to France so possibly it was meant to be part of the Channel Islands instead of the dockyard, The radio cast were not hired, except for Leslie Phillips, who was beginning to have a successful career in film. Jon Pertwee is on record as saying he refused to join the cast because Wilcox was homophobic and would not cast Dennis Price who was a masterly ‘Number 1’. Heather Chasen states she was never offered a role. Why? Again, the accepted history is that Wilcox wanted more `bankable` stars in his production - hence Hattie Jacques, Ronald Shiner, Cecil Parker, with Cardew Robinson with Elvi Hale as the love interest for Leslie. Released through the ‘ABC’ cinema chain in the UK, it went around the world in late autumn 1959 and spring 1960 after its premiere at the Carlton Theatre, Haymarket on Thursday15th October 1959. For dedicated listeners, most years BBC Worldwide continue to release a 2 CD set as well as box sets of a part or whole season. Sadly, fewer shops stock the full range of BBC products these days; it is worth seeking advice to see which collections are currently available. Ebay does have sellers offering MP3 collections of radio shows including ‘The Navy Lark’. These will consist of home recordings of varying quality which are rarely reasonable audio quality and sometimes very disappointing. If in doubt, buy a BBC original or tune in to 4Extra. By 1963, television had arrived in most homes. The Head of Light Entertainment decided, against all the best advice, that ‘The Navy Lark’ had had its day. Laurie was asked to script the selling off of Troutbridge by Pertwee and miraculously the whole crew found themselves working at ‘Troutbridge TV’ in exactly the same hierarchy as before. `The TV Lark` lasted for just 10 episodes of its 16 week schedule but public disquiet meant that storylines associated with the navy were very much back in the show by episode 7, after which `The Navy Lark` completed the season run of 6 programmes on board Troutbridge once again. Sister show ‘The Embassy Lark’ based on some far away island of indeterminate cod-native culture featuring Frank Thornton, Charlotte Mitchell and Derek Francis ran for three seasons. Troutbridge regulars occasionally had parts in episodes but in their ‘Navy Lark’ personas. Southern Television had a different view. It recognised that ‘The Navy Lark’ was one of the BBC’s best-loved comedies and decided to produce its own version entitled ‘HMS Paradise’. Frank Thornton, Angus Lennie, Richard Caldicot and Priscilla Morgan (Clive Dunn’s wife) took centre stage. This interpretation was not going to be a studio based, but filmed on location : on board ship and at sea. The navy supplied dinghies, ships and helicopters together with locations for filming the 26 episodes. Regrettably, due to regional scheduling, the programmes went out in the early evening when fewer people were sat in front of the box in those days. Region by region the show was dropped, leaving just Southern playing the full run including a magnificent entertainment spectacular to rival a Sunday evening variety entertainment aboard HMS Eagle just before it sailed off on manoeuvres, complete with stage sets and props. It is believed the whole series has been 'junked', which means nothing exists. If you know of a recording on a shelf somewhere, do get in touch. The Navy Lark Appreciation Society exists to seek out and share recordings, photos and ephemera from the entire 'Navy Lark' history in all its incarnations. So if you have a photo, a recording you made off air or know of someone with a story to share we are always very interested to build our archive further. Did you appear in the film or TV versions? Did you serve on Troubridge and visit the BBC to watch a recording being made? It is suggested that Jon Pertwee learned three Norwegian words during an encounter with a crew from Norway in World War 2. Keen fans tell me that he has used these in occasional episodes of 'The Navy Lark'. Do you think you know if the story is true? Every anecdote is worth saving. Do get in touch with the editor and she will pass on your details for us to follow up.